The thornless skyline honeylocust tree has captured the hearts of arborists, community foresters and homeowners throughout America. And no wonder. This tree is easy to plant, grows fast, has reasonably strong branches, is aesthetically pleasing and is tough enough to withstand just about any urban setting. It has a distinctive pyramidal form. Develops a strong sturdy trunk and is excellent for where filtered shade is desired in your landscape. It has a beautiful yellow foliage color in the fall season. A very important tree for difficult climates. Skyline Honeylocust tree leaf out later than most other shade trees, thus protecting them from devastating late spring freezes and heavy snow. This tree is also very water thrifty and heat tolerant. Another good reason to plant skyline honeylocust tree is because they drop their leaves earlier in the fall which keeps them from being damaged by early hard freezes and heavy snow. Upright, spreading, uniform branches form a broadly pyramidal shade tree. Finely textured, dark green, fern-like foliage turns golden-yellow in fall. An excellent choice for lawn areas because its deep roots stay well below the surface. Thornless. Hardy to -30°F Maximum Elevation: 6,000 ft. The thornless skyline honeylocust tree can be expected to grow in Hardiness Zones 3–9. 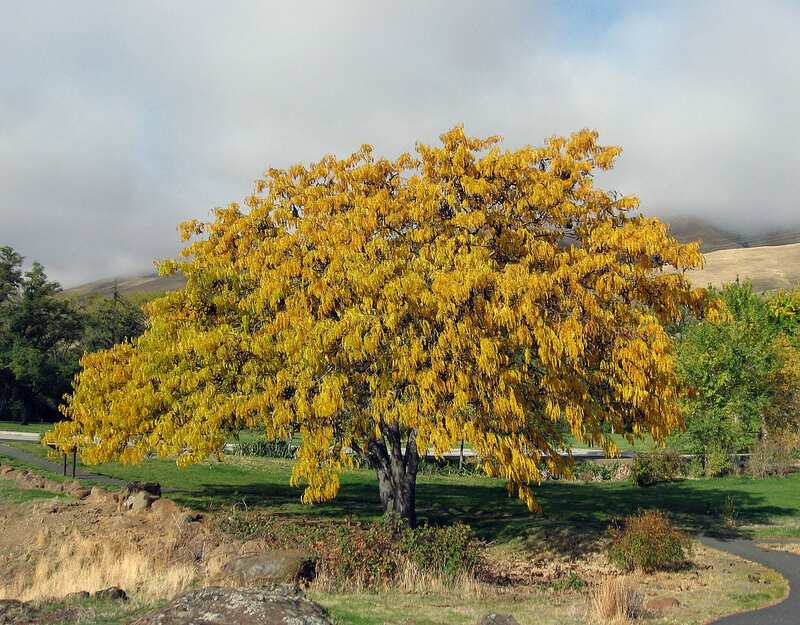 Skyline honeylocust tree grows at a fast rate, with height increases of more than 24″ per year. Features pinnately or bipinnately compound leaves approximately 8″ long with 8–14 leaflets. They are among the last leaves to emerge in the spring. Yields large, brown seed pods resembling twisted leather straps that are 7–8″ long, sometimes reaching up to 18″ in length. Honeylocust make a perfect deciduous tree in a yard that doesn’t want heavy shade. Some selections start out with light yellow leaves that turn green and then yellow again in fall. Honeylocust are tolerant to urban conditions, including air pollution and salt spray, so make great street trees. However, older selections produce brown seedpods that drop in fall and can become messy. They also may have thorns that can be dangerous when working around the tree. Plant from spring or early fall in well-drained, deep, fertile soil. However, honeylocust are also tolerant of various soil types. Space trees 20 to 30 feet apart. Bare Root – Cut open the bundle (top and roots are tied) and separate all the plants. Soak roots in buckets of water until planted. Each plant type will be labeled separately for identification. Do not expose the roots to sun. They should never dry out. Keep roots covered. All bare-root plants must be trimmed when planted. B&B – Soak root ball very well. Containers – Completely saturate all container plants by putting in a larger container of water until stops bubbling, remove. Now you’re ready to plant. Dig a hole at least 6″ wider and the same depth as the root mass. The crown or graft of the plant should be slightly higher than ground level where it was grown at the nursery. Dig a hole at least 6″ wider and no deeper than the size of the ball on the plant. Rotate the plant to the proper position. Never lift or move trees by the tops. With shovel or knife trim bottom 2″ off of the root ball for plants in plastic containers. Bare Root – Prune ALL bare root plants to reduce transplant shock and ensure success. Pruning should occur either before or as soon after planting as possible. All pruning should be done with a sharp pruning shears. B&B & containers – Although it is not essential for B&B or containers to be pruned after planting, a light pruning for shape, to remove any broken branches from shipping, or to thin out a heavily branched plant will help in the transplanting process and in the appearance of your new planting. Prune in spring to remove small shoots along the trunk, suckers, water sprouts and competing branches. Prune out dead, diseased or broken branches any time. Honeylocust trees can have a myriad of insects and diseases attacking them.